CLEVELAND, Ohio – Mace® Security International, Inc. today announces the launch of the Personal Alarm Heart, a pull-pin style personal alarm that is designed to steer away a potential assailant. This unique, powerful, compact key chain personal alarm is equipped with an easy to use pull-pin that activates the 120dB alarm sound, which is equivalent to a police siren. Personal alarms are one of the fastest growing solutions in self-defense. These types of alarms are legal in all 50 states and TSA approved. Personal alarms require no prior training to operate and can be used at any age. In a situation, victims are often too traumatized to shout for help in unfamiliar and dangerous situations, increasing vulnerability. By using a personal alarm, you are able to alert others that you are at risk and scare off the would-be assailant. The Mace® Brand Personal Alarm Heart is priced at $11.99. 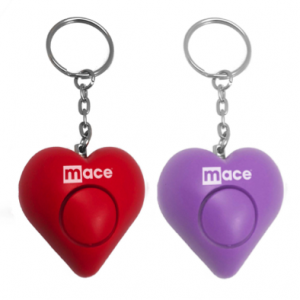 To purchase the personal alarm heart, visit the Mace website at http://www.mace.com/macer-brand-personal-alarm-heart?SID=k1bdl04nibqftifbr16ll6d7t0. Mace® Security International, Inc. is a globally recognized leader in personal safety and security. Based in Cleveland, Ohio, the company has spent more than 40 years designing and manufacturing consumer and tactical products for personal defense, security and surveillance under its world-renowned Mace® Brand—the original trusted brand of defense spray products. The company also offers aerosol defense sprays and tactical products for law enforcement and security professionals worldwide through its Mace® Take Down® brand. CLEVELAND, Ohio – David Happe, executive vice president of e-commerce at Mace® Security International, Inc. (MSI), published a 21-page white paper on recent legislative developments and trends in several cities and states across the country regarding mandates for personal alarms for housekeepers. The white paper analyzes legislative actions for hotel employees in cities around the United States; Seattle, Chicago, Washington and New York City. Along with the cities listed, Happe also discusses actions that the states of California, Arkansas, Massachusetts and New York are taking currently to protect hospitality employees. After the detailing each legislative action, Happe discusses solutions for the legislations that include the Mace® Alert 911 and Mace® Brand Personal Alarm Keychain. To request a copy of the white paper, please email whitepaper@mace.com and include your company name and phone number. The white paper is available free to qualified businesses, state and local governments, trade organizations and media. Mace® reserves the right to restrict distribution of the copyrighted material only to qualified industry executives at Mace®‘s sole discretion. For additional information on Mace® Brand’s line of personal alarms, visit www.mace.com. For more information on Vigilant alarms, visit www.vigilantpps.com. CLEVELAND, Ohio – Mace® Tactical Solutions (MTS), a division of Mace® Security International, Inc. (MSI), featured a full-line of less lethal munitions and launchers for law enforcement, corrections and military markets at the 2018 SHOT Show in Las Vegas, Nevada. The addition of the munitions line will enhance the product offerings of MTS to customers and offers customers a one-stop shop for less than lethal products. A comprehensive catalog of products is available on the MTS website at www.macetactical.com. “Our objective with this launch is to service our customers with a strong in-stock position and short delivery times,” said Eric Crawford, vice president of sales at MSI. For more information on the MTS line, contact Doug Melzig at dmelzig@mace, (440) 730-4642 or Eric Crawford at ecrawford@mace.com, (440) 730-4641.